In 1958, Pontiac dominated the Daytona Speedweeks Trials, but many car buyers were not impressed; the styling of the ’58 models were somewhat less impressive than their performance. That combined with the economic downturn that year, dealt a blow to sales (and not just for Pontiac). The ’59s had to be better. 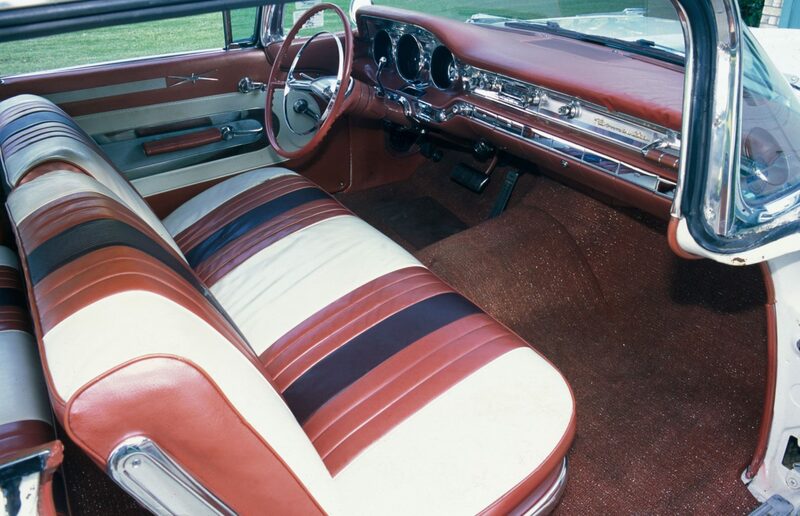 The GM styling department had been long at work on a styling makeover for 1959 and the new Pontiacs were much more than better. The public loved the new look, the split grille, “Wide Track” and all. America’s most popular automotive writer, Tom McCahill, praised the ’59s in the December 1958 Mechanix Illustrated, writing that “… the Pontiac boys … eagled the hole and came up with the best looking car in the General Motors line and quite possibly the best looking ’59 car on the road.” Motor Trend was impressed sufficiently enough to award their coveted “Car of the Year” award to Pontiac. Other prestigious publicity came as the result of a 1959 Bonneville convertible serving as the official pace car of the inaugural Daytona 500 stock car race and “Fireball” Roberts’ 145mph practice laps in a ’59 Pontiac during qualification trials for the race. As already suggested, some of the appeal of these Pontiacs was the so-called “Wide Track” chassis. The wider track provided for a better handling car by moving the wheels farther from the kingpins and spindles. The front and rear track each spanned 63.7 and 64 inches, respectively. The fact that the increased track dimensions improved handling was only of secondary importance; the real purpose was simply for styling. Fortunately, what looked great was also functional. Chuck Jordan proposed the idea of widening the front and rear tracks to push the wheels out further on one of his earlier designs. When the concept was adopted for Pontiac, their advertiser coined the term “Wide Track” for marketing purposes. How Pontiac evolved in the 1950s to the point of producing the “Car of the Year” is an interesting story. Styling had not been a problem for GM once Harley Earl came on board and created the “Art and Colour Section.” He had a knack for understanding what the public would want each succeeding year. His go-all-out and then back-off approach helped make GM highly successful. Earl brought the tailfin to the automobile as well as other features like the wraparound windshield. Pontiac languished in sales regardless of its styling during the early Fifties, though. The cars were viewed as good reliable transportation, but they lacked the pizzazz provided by a performance image, which was needed to win over young car buyers. The straight-eights, Indian mascot and “Silver Streak” styling motif on the hood had outlived their usefulness. What Pontiac needed was V8 power and an image change. By the time Knudsen made the observation some in Pontiac had already seen a need for a change of direction. Pontiac’s adverting had begun promoting the performance aspects of their new V8 and prior to its offering, the division displayed a racy, two-passenger show car called the Bonneville Special at the 1954 GM Motorama. The fiberglass car was completely unlike anything ever seen from Pontiac except for its “silver streaks” across the hood and its straight eight underneath it. At least the straight eight had four carbs and other performance oriented modifications. The name, Bonneville, was synonymous with speed and it may have been the most important feature of the show vehicle. Then came the ’58s, with their fine performance capabilities but outdated styling. When the designers went to work on the ’59 models, they were expecting to update the look of the ’58s. Earl had supervised the revisions and was then sent to Europe to work on other GM interests, such as Vauxhall Motors in England and Adam Opel in Germany. Some suspect Earl was sent to Europe to get him away from the ’59 restyling program. Many features on the clay models were bizarre, perhaps the result of demands on the designers to devise wilder and wilder proposals. Also around this time, a then young GM stylist named Chuck Jordan got a sneak peak at what Chrysler Corporation was doing under Virgil Exner’s guidance. Jordan told his co-workers about the all-new cars he had seen and soon they too were stunned by what Exner was doing. Their look at Chrysler’s new models had a dramatic impact on styling at GM. Their two-year lead-time seemed not nearly enough to redo the designs scheduled for 1959. 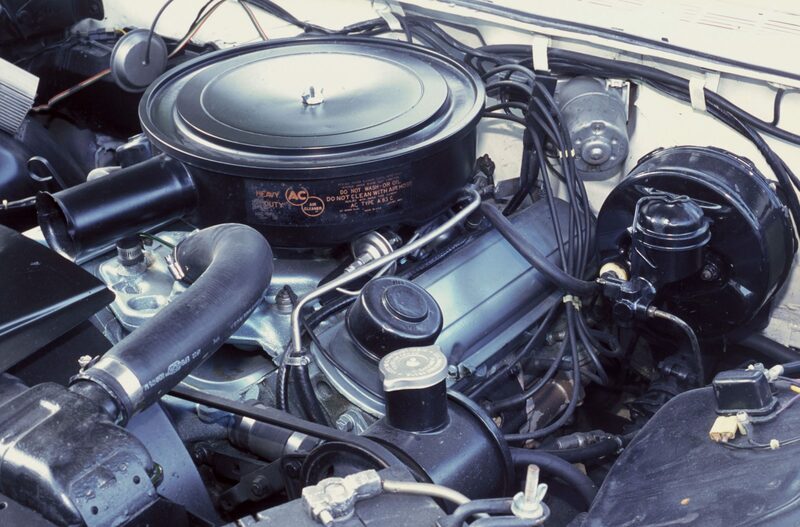 Further complicating matters, a decision was made that the GM divisions would share bodies instead of having the A-body for Chevy, the B-body for Pontiac, Olds, and Buick, and the C-body for Cadillac. Pontiac’s chief designer, Paul Gillan, was responsible for the new split grille. At first the idea was rejected, but was then reinstated. (The split grille was dropped for 1960, because of a mistaken belief that customers did not like it; complaints brought it back again for the 1961 model year.) 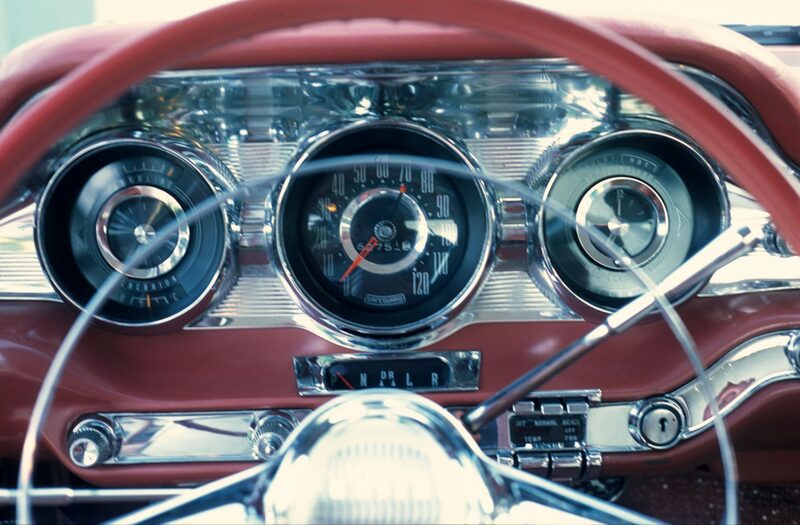 The twin-finned quarters were first used on one of Harley Earl’s proposed 1959 designs, based on the 1958 A-body. The stylists did their job well for the ’59 Pontiac. The top-of-the-line Bonneville brought 77,891 orders; this figure breaks down into 27,769 two-door hardtops, 38,696 four-door hardtops, and 11,426 convertibles. In all, 383,320 Pontiacs were built for the model year, which was nearly a 75 percent increase over the output for the previous year! The maroon and white Bonneville shown here is a mostly original unrestored car and was owned by an East Texas collector at the time of our photo shoot. The car is powered by a 300-horsepower 389 V8 bolted to the optional HydraMatic automatic transmission. Other options and accessories on this Pontiac include radio, outside rear view mirrors, power brakes, tinted glass, white sidewall tires, and fender skirts. With the introduction of the 1959 models, the Wide Track had left its footprint on the American road. 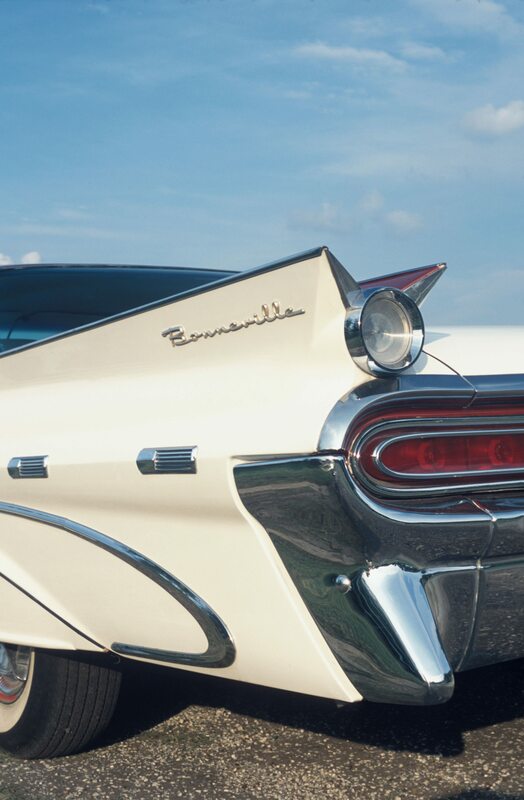 If you have an early model Pontiac Bonneville or another collectible you’d like to insure with us, let us show you how we are more than just another collector vehicle insurance company. We want to protect your passion! Click below for an online quote, or give us a call at 800.678.5173.